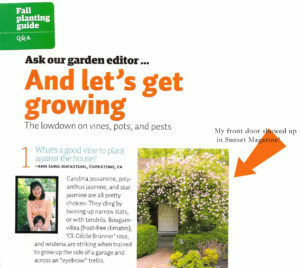 …Thumbing through the new September Sunset Western Garden magazine I read an article (page 54) addressing reader’s questions regarding vines that can be planted near the house, and lo and behold, a picture of my very own rose arching over my front door was pictured! First of all, the rose over my front door is a Cecil Brunner. It is lovely when it blooms, really showy, but it only blooms once a year in the spring. 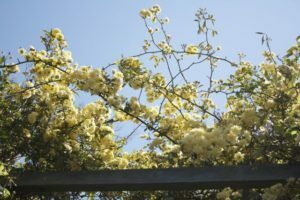 During the rest of the year I have to prune back the new wandering branches and stocks as they will completely obstruct my entry. But this rose is merely child’s play when it comes to vines. 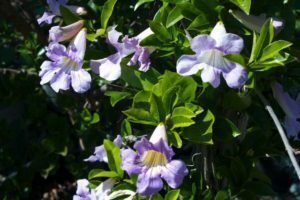 For instance – Wisteria, Trumpet Vine (Campsis Radicans), Passion Flower (see picture), Ipomea (Morning Glory) and the Lady Banks Rose can all grow 30 feet high or wide! Be careful not to plant them close to trees because they will climb them and overtake their foliage. 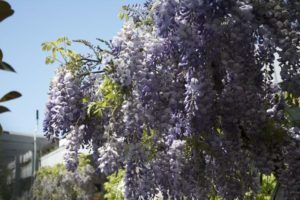 Wisteria will eventually grow a trunk the size of a tree as will the Trumpet vine. 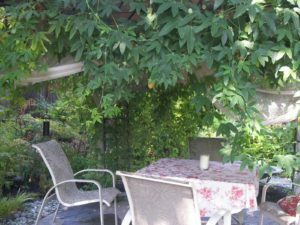 Make sure that you have strong supports, and preferably metal (any wood support will eventually rot, not to mention it’s practically impossible to manage the wood with vines growing on it). Ipomea, or Morning Glory, is beautiful in bloom but it will go dormant in the winter, looking weedy and dead. Also once you have it watch out – it’s hard to get rid of! 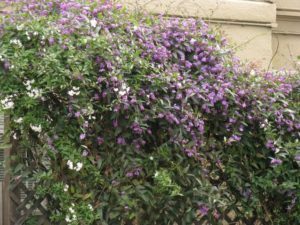 Great all around vines are: Solanum jasminoides (potato vine), Hardenbergia, Purple Trumpet vine and many of the Jasmines. Carolina jasmine too, but keep in mind that this vine gets very big and full so make sure you have enough space.